I watched The Barclays ATP tour finals on Sunday with immense relish. 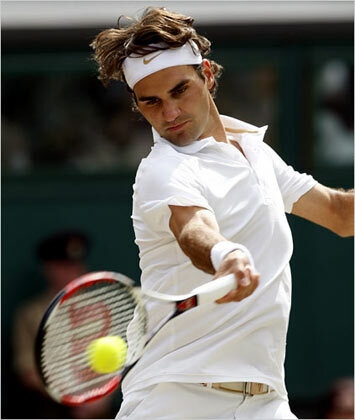 As an ardent Federer fan, I cannot remember being so desperate for him to win. Normally unruffled and calm, this sunday there was ample fist pumping and “come on!”s as I sat on the sofa with my feet on the table. Seriously though, I am extremely happy about Fed’s win. Arguably Nadal wasn’t at his best (for whatever reason) and maybe the surface did not favour Nadal’s usual technique of targeting his opponent’s one handed backhand. What was happening though, was that Fed was pushing more to grab control of the rallies and seizing his opportunities. The frustrating trend of holding serve till the tie break and then trying to edge it seemed forgotten as he charged the net, flirted with the lines and more than once unleashed those sublime ground strokes that leave you staring that the TV with your jaw on the floor. This was not a grand slam, it was not even a best of five sets match, so the ATP tour finals can hardly be said to portend the future. After his abysmal (by his standards) season, a good victory over Nadal can only do wonders for Fed’s confidence and hopefully spur him on to go about his grand slam quest with renewed vigour. I also hope we have some new faces in the 2011 grand slams. I will root for Murray and Djokovic to add some title(s) to their career haul. There is something massively wrong if the total number of grand slam titles held by the world’s top 10 is 27, with 25 held by the top 2. Today’s bad news was hearing about Leslie Nielsen’s death. Anyone who has watched that masterpiece of comedy Airplane! and Nielsen’s poker faced portrayal of Dr. Rumack will feel a twinge of sadness at Nielsen’s death. Who should pay for my education? The Browne review has been drawing a lot of attention in the UK recently, with a lot of students protesting against fees that will burden them with debt. Having read the student funding section of the report, I disagree with the whole student-burdened-with-debt idea here is why. As consumers, everyone would like a free education. Not to mention free health care. And while we are on the topic, maybe a free cleaner and cook as well. There is only one problem with free stuff. In most cases, it does not exist. If not the consumer, then someone else, somewhere is paying for the free stuff. In turn this means that this particular consumer is paying for others consumption. The options are to fund services from taxes or prices. In my economically untrained opinion, prices are better, but that discussion is for some other time. What should a good funding scheme for education encompass? There is quite a lot, but primarily it should allow any student, irrespective of circumstances, to study any course he like. Secondly, it should safeguard universities, preferably from the vagaries of government policies. Thirdly, the financial cost should have a low impact on the students’ career choice. Finally, if for some reason the student has had a limited income for most of his life, he should not have to scramble in his last few working years trying to earn enough to pay back any loans. The recent Browne review, which put forth a new funding scheme for UK universities achieves all these objectives. The student chooses the course they would like to follow and the government pays their course fees upfront to the university. Once they graduate and get an income above £21000, they pay a fixed percentage (9%) of the income above £21000 every year towards repaying the government. If their income falls below the threshold, they stop paying and the remainder of the loan is written off after 30 years. This system gives the universities the money they need. The student does not have to commit massive amounts of money upfront and does not really have to tailor their careers around the obligation of repaying their loans. If, due to circumstance or career choice, they cannot repay their debt, it is simply written off. I cannot think how this system is different from the purportedly “free” education. In addition, it has the advantage of most people paying only for what they consume themselves without having to shoulder someone else’s bills. This scheme is a good idea, as long as the government keeps income taxes low. They should not accept this system and raise income taxes. That is plain sneaky.